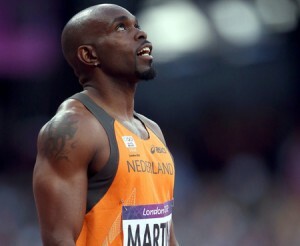 HENGELO, WILLEMSTAD - Churandy Martina did not really make a 'battle' of 200 meters at the FBK Games in Hengelo. The popular athlete was not involved in the strong field and ran to the sixth place in 20.85. Hensley Paulina ran behind his teacher Martina and finished seventh in 21.05. The South African Luxolo Adams won the race in 20.34, one hundredth faster than the Spanish reigning European champion Bruno Hortelano. Churandy came back from a season full of injuries. Liemarvin Bonevacia also came back from an injury. At the 400 meters he was with the top runners, but the last 100 meters were too much for him. He finished sixth in 45.77, but with that, he complied with the European Championship limit. "Yes! I am so, so, so happy. I'm back! ", He said afterwards in a comical interview. Abdalleleh Haroun won the 400 meters in 44.35, the fastest time ever in Hengelo.